have 2G can use and the partion of mvtool path should 2G can use.\n"
# echo "get option $INSTALL_PATH"
# echo "get option $MVTOOL_DIR"
echo "Input Error!!! Argument invalid!!!" echo -e "clean *tar.gz ok, you can remove IPNC_RDK_DM36x_Release_3.0.0 \nfrom shared zone to other disk or partion to reduce virtual disk size"
echo "Error!!! 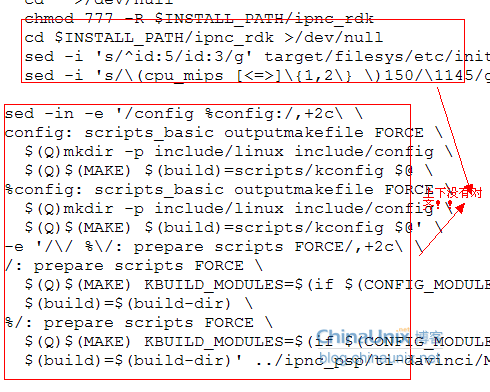 Usage: use source to excute the script, Don't use sh srcipt or ./srcipt!! !eg: source init.sh"
echo "Please wait, it will spend about 3-6 minutes!" [ $? ] && echo "Decompress mvltools5_0_0801921_update.tar.gz Ok..."
[ $? ] && echo "Decompress DaVinciLSP_02_10_00_14.tar.gz Ok..."
echo -e "echo $MVTOOL_DIR already exists, skip decompress Mvtool"
[ $? ] && echo "Decompress PrivateTI_IPNC_DM36x_3.0.0.tar.gz Ok..."
[ $? ] && echo "Decompress OpenSrc_IPNC_DM36x_3.0.0.tar.gz Ok..."
[ $? ] && echo "Decompress Appro_IPNC_DM36x_3.0.0.tar.gz Ok..."
[ $? ] && echo "Decompress dvsdk_ipnctools_dm36x_3.0.0.tar.gz Ok..."
[ $? ] && echo "Decompress lsp_ipnc_dm36x_3.0.0.tar.gz Ok..."
[ $? ] && echo "Decompress u-boot-1.3.4_ipnc_dm36x_2.0.0.tar.gz Ok..."
[ $? ] && echo "Decompress ipnc_app_dm36x_* Ok..."
[ $? ] && echo "Decompress filesys_ipnc_dm36x.tar.gz squashfs.tar.gz Ok..."
"\nother options you can refer to Users_Guide_IPNC_DM36x.pdf"